Given the problem that we face of Hong Kong’s landfills nearing capacity, I agree with the government’s decision to build an incinerator to burn the large volumes of waste generated by citizens. More than 13,000 tonnes of municipal solid waste ends up in our landfills every day. It does not help that this is a densely populated city and many people are wasteful and lazy about disposing of waste. They fail to recognise the importance of the Three Rs – reduce, reuse and recycle. Many residents are still unwilling to separate waste and take recyclable material to recycling bins. We may want to see a reduction in the volumes of waste produced, but are reluctant to take the necessary steps as individuals to help make this happen. One of the aims of the Environment Bureau’s Blueprint for Sustainable Use of Resources was to get people to generate less waste at source, as one way of solving the city’s waste-management problem. The incinerator the government will build will use what is known as “3T” technology to control emissions – temperature, turbulence and time. Using high temperatures (over 850 degrees Celsius) and high turbulence to mix waste with oxygen thoroughly ensures complete combustion. Waste and flue gases will be superheated to reduce air pollutants. This means that we may not have to worry about possible air pollution. The government is doing its part by building the incinerator. Citizens can play their part by embracing the Three Rs principle so that less household waste ends up in our landfills. We should all try harder to be more environmentally friendly. Air pollution in the United States may be causing thousands of premature births each year and costing the nation billions of dollars, according to a new study published in the journal Environmental Health Perspectives. The researchers concluded that just over three per cent, close to 16,000, of all the preterm births in 2010 could be attributed to fine particulate matter (PM). It is believed that exposure to air pollution can cause inflammation of the placenta during pregnancy, which can ultimately lead to an early delivery. Preterm birth is associated with a variety of medical problems including an increased risk of infant mortality, breathing and feeding difficulties, cerebral palsy, increased risk of developing other diseases and developmental delays that can lead to cognitive impairment throughout life. The direct medical costs were estimated at about US$ 760 million in 2010. Far weightier, though, were the costs associated with lost economic productivity, and altogether the medical costs and lost economic potential added up to just over US$ 5 billion. One of the goals of a sustainable city is to effectively manage material flows into and out of the city. Garbage, or what environmental engineers call solid waste, presents some of the most difficult challenges to urban sustainability. The city and county of San Francisco’s SF Environment department has set a goal of zero waste by 2020. That formerly future-sounding date is just four years away. To achieve 100 percent zero waste, SF Environment will continue to advocate for state legislation and partner with producers to develop a producer responsibility system, where producers design better products and take responsibility for the entire life-cycle of a product, including take-back and recycling. The city’s zero waste policy includes three goals: 1. prevent waste; 2. recycle and compost; and 3. safely handle toxics. San Francisco’s unique political and social culture must be seen as a major factor contributing to this program’s success. People in that city behave as if reducing waste and recycling are important social behaviors. In contrast, New York City’s waste diversion rate is 16%. The goal is to get to zero waste by 2030. It’s a little difficult to see how that goal will be achieved. The city’s target for FY 2016 is 19%, but according to the NYC Mayor’s Management report, the actual diversion rate is anywhere from 1.2- 2.9% below target. Any casual look at New York City’s public recycling bins will provide a sense of the difficult road New York must travel to reach anything approaching zero waste. Paper bins are filled with bottles and the bottle bins are filled with a wide variety of unsorted waste. Northern Californians may be thoughtful about waste disposal, but New Yorkers can’t be bothered. It is not clear that New York is capable of a cultural shift deep enough to achieve the diversion rates already reached in San Francisco. Each city is different, and New York’s pace, diversity, and size make comparisons to San Francisco difficult. Still, large-scale behavior changes can be achieved with leadership, strategy and creativity. New York City has eliminated indoor smoking in public places. New Yorkers have learned how to comply with alternate side of the street parking rules and some are even learning how to stop jaywalking. So it is possible that waste disposal behaviors could change. But it will take leadership and the sustained attention of the mayor and the media. It’s unlikely to happen because garbage has little appeal as a political issue. Climate change holds conferences in Paris and attracts attention at Davos. Garbage gets a little less glamor. In any case, behavior change alone is not sufficient. The recycled waste must actually be reused—a problem with the weak market for some recycled substances. The technology of waste sorting and the energy efficiency and cost-effectiveness of recycling also need improvement. A city’s system of recycling and waste management is as important as an individual’s waste disposal behavior. The technology and market will come to New York City, but probably not by 2030. Zero waste is an element of the concept of a circular economy. In a circular economy, all waste from consumption becomes an input into new production. Inevitably there is some leakage in the tightest circular production process. But the goal is to move from a linear model of production-consumption-waste to one more closely resembling a circular model. I don’t think of zero waste as an achievable operational goal, but rather as a model and an aspiration. It is a way to think about resource use and waste management, rather than an absolute target. It requires a paradigm shift or a new way of thinking about consumption and garbage. Instead of mindlessly tossing something you have consumed into a waste bin, you sort it or consider how it might be re-used. In the case of production processes, it includes the concept of producer responsibility. The producer includes in the price of a good an incentive to bring the good back to the place of purchase or to the manufacturer. The manufacturer, in turn, designs the good to be mined for resources or to be reconfigured for additional use. Of course moving the good or material through the production process requires energy and so the closed system works best when it is powered by renewable energy. These ideas of closed systems of production and consumption are central to the concept of the sustainable city. As the mechanization of agriculture reduces rural employment and as the Internet communicates the appeal and seductiveness of urban lifestyles, more and more of the world’s population is moving to cities. This creates opportunities for more efficient production, distribution and consumption of goods and services and leads to the possibility of systems that approach the goal of zero waste. A new plan to send Brooklyn’s garbage upstate would solidify the city’s waste export strategy for decades, but also shows how impractical the system has become. Under a newly proposed 20-year contract with IESI—a major industry player owned by Canadian company Progressive Waste Solutions—much of Brooklyn’s residential garbage would be shipped to the company’s Seneca Meadows landfill at a projected cost of $3.3 billion…New York has struggled to deal with its garbage in a sustainable way since the Fresh Kills landfill closed on Staten Island in 2001. According to Department of Sanitation (DSNY) data, it cost $99 to dispose of a ton of garbage in 2000 versus $145 in 2014 when adjusted for inflation. It is clear to most experts that a system of recycling facilities, waste-to-energy plants and changed public behavior would be a more cost effective and environmentally beneficial waste management system for New York City. Unfortunately, New York can barely site marine waste transfer facilities and has been unable to build waste-to-energy plants or other elements of a more advanced waste management system. New Yorkers simply won’t accept construction of those facilities in their neighborhoods. In any case, as New York’s land prices rise, it becomes increasingly uneconomical to locate those facilities within the city. The gap between San Francisco’s accomplishment of 80% landfill diversion and New York’s 16% is huge. New York was ahead of its time in building its water and mass transit system, but is far behind the times in dealing with its garbage. When compared to San Francisco, the two waste management systems are truly a tale of two very different cities. There have been multiple scientific studies that all concur: scientists know that climate change is happening and it is largely caused by humans. I recently wrote about this here, where I reviewed the studies. It turns out that the more scientists know about climate change, the more they are convinced that humans are warming the planet. In fact, the consensus is extraordinarily strong. But it isn’t just that the vast majority of scientists agree; it’s that the best scientist agree. We find that the contrarian scientists tend to be less accomplished, have had their research found to be incorrect time after time, and they produce less science. But very recently, a study from the George Mason University Center for Climate Change Communication was completed that adds to our knowledge on the consensus. Lead author Ed Maibach and his colleagues are very well-respected surveyors and scientists who study this topic. The study didn’t focus on what we think of as climate scientists – rather they polled meteorologists. There were actually two surveys that were merged. In one, the authors identified 1038 professionals currently working in broadcast meteorology from the American Meteorological Society (AMS). In a concurrent study, the authors obtained a list of members from the AMS who were not broadcast meteorologists. The two groups were asked a series of questions on whether climate change is occurring, the degree to which respondents felt humans were responsible, what could be done to minimize climate change, among others. The authors also asked about the educational background of the respondents. Not all members of the AMS are meteorologists. Additionally, someone working in meteorology is not necessarily a climate scientist. Similarly, a climate scientist is not necessarily a meteorologist. Sometimes these populations overlap but in many cases they do not. One thing that tends to differentiate practicing meteorologists from climate scientists is that meteorologists tend to observe short-term weather more, while climate scientists tend to look at long-term trends. While this difference may sound trivially obvious, it’s an important distinction to keep in mind because it suggests meteorologists may be more likely to see differences in observed weather patterns. Climate scientists would be less likely to be swayed by changes in weather patterns. So what did the survey find? First, nearly every meteorologist (96%) agrees that climate change is happening, and the vast majority are confident in their opinion. Only 1% felt that climate change isn’t happening (3% did not know). Next, a large majority feel that climate change is being caused by humans. For instance, 29% believe that the change is largely or entirely human caused; 38% think most of the change is from humans; 14% answered that humans and natural factors are about equally responsible. Only 5% felt that climate change is mainly natural. Another important finding is that most meteorologists feel that some of the change can be averted, based on how we react. Small minorities felt that a large amount of change can be averted or that climate change cannot be averted. These views have changed over the years. For instance, almost 20% of meteorologists say their opinion on climate has changed over the past five years. Of that group, the vast majority are more convinced that the climate is changing and they cite a variety of reasons including new research, seeing first-hand evidence, the consensus amongst climate scientists, or from interactions with climate scientists. A final important result is that only 37% of the AMS respondents consider themselves climate experts. Speaking more broadly about the meteorology community beyond the AMS, that population tends to be more skeptical that the Earth’s climate is changing. I tend to believe that the skepticism is partly because meteorologists in general focus on short-term events and also because a great many non-experts are counted as meteorologists (including people who do not have degrees in any science, let alone a meteorological science). Despite this, meteorologists’ views are important not only because they are a consistent scientific presence in many households, but also because the collective weather observation record from the meteorological community is a resource that is unmatched. It is not surprising that more meteorologists are now more convinced that human-caused climate change is happening. That is how science works. As the scientific evidence becomes more irrefutable, which is the case with harmful, human-caused climate change, more scientists of all types will become convinced. Those changes are already evident on the ground. In 1975, there were only a few days a year when ships could move from Barrow to Prudhoe Bay off the north coast of Alaska. Now that window lasts months. Many are part of a growing movement sometimes called Zero Waste or the Circular Economy. It entails trying to eliminate tough-to-recycle items like flimsy plastic bags and also pioneering new ways to recycle or compost everything else. Often, cities around the world have led the way, including Portland, Ore.; Seattle; and Milan, as well as the Basque region in Spain. That has given rise to a trash tourism circuit. Likewise: know anyone who resides in Santa Monica ? Some six million Americans have drinking water tainted with higher levels of lead than allowed by US federal guidelines, the USA Today reported on Thursday. With the nation focused on a major crisis in Flint, Michigan, where lead from aging pipes leeched into the municipal water supply, the newspaper launched an investigation which found higher than acceptable lead levels in about 2,000 water systems across the United States. Tainted water was supplied to hundreds of daycare centers and schools, the report said. Children are the population most vulnerable to the pernicious effects of lead, a toxin which affects the neurological system and can lead to permanent learning delays and behavioral problems. Higher than allowed lead levels were found in all 50 US states, USA Today reported. A sample of water drawn from one elementary school in Maine found lead levels some 42 times higher than the Environmental Protection Agency limit of 15 parts per billion, while a preschool in Pennsylvania recorded lead levels 14 times higher than allowed. More than 8,000 children in Flint, economically devastated by shutdowns and layoffs in the car industry, were exposed to lead for more than a year before the tap water contamination was uncovered by citizen activists. The news report was published as Michigan Governor Rick Snyder prepared to appear Thursday before a congressional oversight committee probing the Flint crisis. Critics are calling for the resignation of Snyder, who ordered water from the Flint River to be diverted to supply water to the city, in a cost-cutting measure. Experts believe that the chemical-laced Flint River water corroded lead-bearing pipes, allowing large amounts of the chemical element to leech into the city’s water. Two activists and a university student challenging the controversial proposed HK$141.5 billion third airport runway at Hong Kong International Airport failed to meet the minimum requirements to mount their legal bids. The Court of First Instance on Tuesday refused to grant permission for City University student Hui Sin-hang, League of Social Democrats vice-chairman Raphael Wong Ho-ming and social activist Koo Sze-yiu to lodge a judicial review against the Hong Kong Airport Authority  and the Chief Executive in Council over the planned new runway on Lantau Island. The trio attacked the infrastructure project on various grounds, including its business model and the legality of Hong Kong’s sharing airspace with mainland China once the new runway is completed. The applicants had to demonstrate their contentions were “reasonably arguable” before being allowed to proceed to the actual hearing. However, the court on Tuesday ruled they did not do so. In his judgment, Mr Justice Anderson Chow Ka-ming wrote that he refused the argument put forth by Hui’s barrister Hectar Pun Hei SC, who argued that an additional fee ranging from HK$90 to HK$180 and to be levied on passengers by the authority would be unlawful. Pun earlier argued the airport construction fee would violate “the no levy without authority” principle, stating that the government had no power to impose a fee unless conferred by law. Pun earlier maintained that the third runway would result in Hong Kong sharing airspace with mainland China – amounting to a violation of the Basic Law – because the city should be responsible for its own aviation management. But the judge said that, after the shared arrangement, the Civil Aviation Administration of China  would only be responsible for a small portion of the city’s airspace. At the hearing, Wong, representing himself, argued that the authority had to adhere to a commercial principle ensuring that its revenue could meet its expenditure according to the ordinance. Chow countered, however, the principle could be read loosely as the third runway was a one-off project. Wong also argued it was unlawful for the government to relieve the authority from having to pay dividends for 10 years in support of the runway. But Chow ruled it was up to the authority to grant the dividends and not an order by the government. Chow also rejected claims advanced by Koo, who was absent from the hearing, ruling they were similar to Wong’s. The Consumer Council has released a study on sustainable consumption. Most of the respondents in the survey have high recognition of sustainable consumption. However, there’s a big gap between recognition and behavior. Although the respondents said they agree with the concept of sustainable consumption, most of them are willing to put it into practice only if it doesn’t involve extra effort or costs. For example, most respondents understand the concept of waste recycling, but many are not willing to sort out their garbage because it’s “inconvenient” to do so. When we talk about environmental protection and sustainable development, we often think of enterprises and producers. We believe they should bear the biggest responsibility. That’s true, but the role of consumers is also crucial. France dumps nearly 7.1 million tons of food every year. Of this amount, 67 percent comes from consumers, 15 percent comes from restaurants while shops contribute 11 percent. If consumers turn their support for sustainable consumption into practice, we can substantially reduce waste. 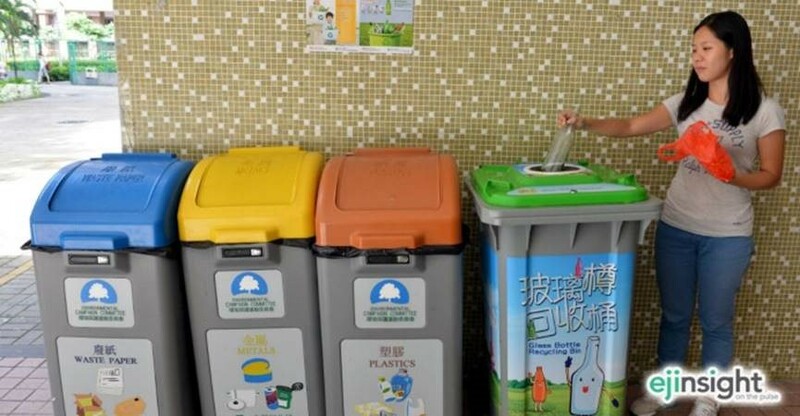 Hong Kong has been promoting waste treatment programs for years, but the programs or regulatory rules are hardly about consumers. Education for the consumers about “responsible consumption” is an indispensable chain. The government and business owners may consider providing more economic benefits to encourage consumers to prefer reusable products, sort their waste, and practice responsible consumption. To promote sustainable development, the government, enterprises, consumers and other stakeholders should all get involved. This article appeared in the Hong Kong Economic Journal on Mar. 8.